Paro Ventures is a brand marketing consultancy supporting high growth companies ranging from early stage ventures to Fortune 500 companies in the consumer products space. Paro Ventures provides marketing support encompassing marketing plan development, brand marketing strategy, brand positioning and brand identity development, new product innovation, marketing communications, and all key areas of brand building. Marsha Joseph, the company’s founder/principal, has over 15 years of brand marketing experience in start-ups, Fortune 500 companies and global businesses. 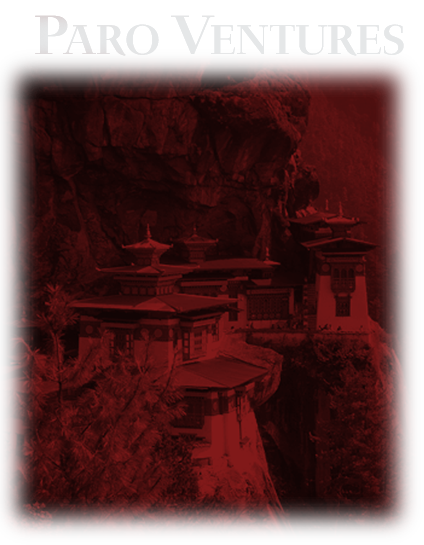 Photo: "Tiger's Nest" in Paro, Bhutan. © M. Joseph 2005. Paro Ventures name was inspired by this place in the Himalayas where visitors overcome a challenging climb to reach great heights.